The Purge: Election Year Review | Nerd Much? The Purge has been one of weirdest series to watch develop over the coming years, as its initial film was a dull, formulaic horror film. The follow-up, The Purge: Anarchy, not only changed over to a more action oriented experience, but it took the series in a direction that was more befitting to its failed utopian setting. 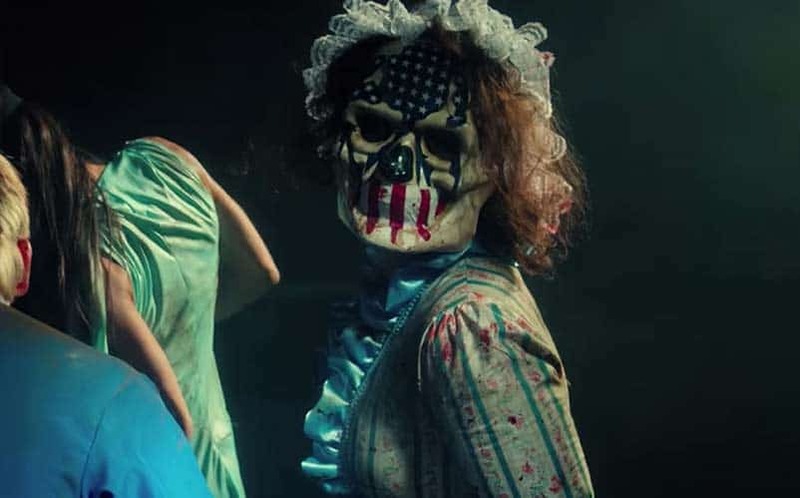 Now, with the third film in this series looking to push every insane aspect to the absolute limit, The Purge: Election Year proves to be an entertaining romp whose quality settles somewhere between the first two films. This year’s Purge follows the story of Senator Charlie Roan (Elizabeth Mitchell) as she is targeted by the government due to her anti-Purge views. Roan is close to winning the presidency, and to no one’s surprise, the radical party running it has taken offense to her existence. 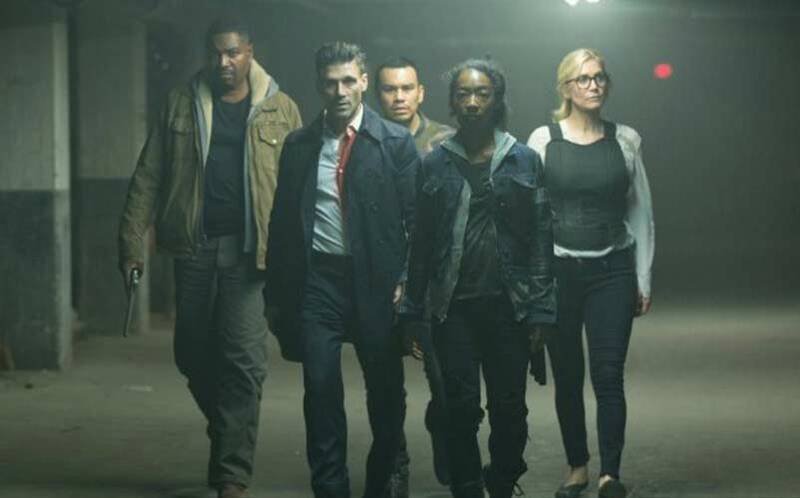 As you can expect, they decide to use this year’s Purge to get rid of her, ending up with Roan and her bodyguard Leo Barnes (Frank Grillo) evacuating the safe house and stranded in the streets of D.C. with every crazy in town. It’s a simple set up, and much like the second movie, this plot is basically just an excuse to take a walking tour of macabre and twisted scenarios. 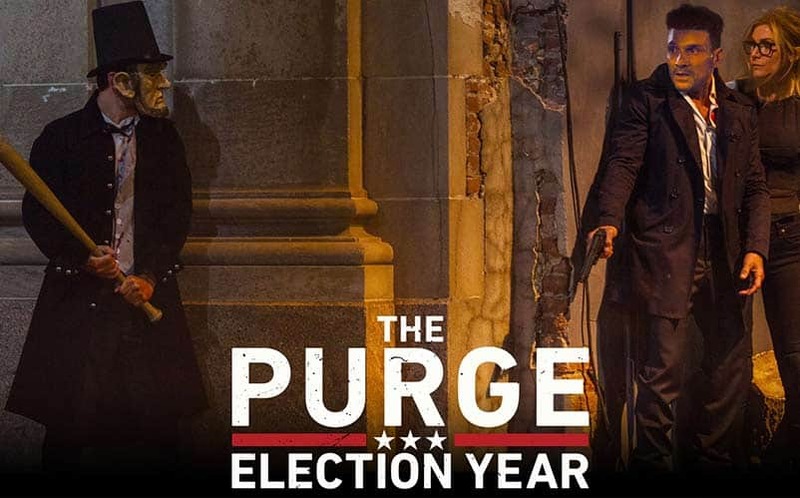 The Purge: Election Year has a lot of big statements to make, and it’s clearly not shy about voicing them throughout the film. While Anarchy touched upon the prospects of the Purge’s use to weed out the poor, Election Year declares it through a bullhorn. However, classism isn’t the only concept discussed this time around, as radical religion, gun culture, and even our current election are remarked upon. Even though our own presidential candidates aren’t directly remarked upon, within ten minutes, it’ll become fairly obvious on which fictional political figure is a stand in for our own real political figure. 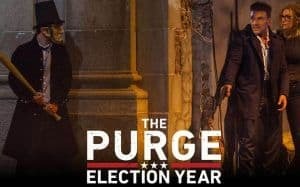 In a lesser film, this would be a glaring issue, but given that The Purge: Election Year ‘s set pieces include a bunch of foreigners (we’ll get to this) dressed in American iconography, a church mass full of Purgers, and a jaded group of millennials out having a “good time” the film can afford to be blunt. However, the film has a bad habit of only touching upon some of these ideas and never really brings them up again. The concept of people from other countries coming to ours specifically for The Purge is a truly unique idea. It helps with the world building and the perception that the rest of the world has, but9 director James DeMonaco wastes this opportunity. Most of the interesting and new concepts brought up in Election Year are just transformed into another sideshow of crazy things that happen during The Purge. There’s a lot going on in this horror film, not including the side characters that are forced into this scenario by pure bad luck. They are simply survivors of The Purge and have fairly moderate motives for waiting it out in their respective areas. Two of them want to protect their deli from looters, while the other is helping with an underground hospital for the stranded and homeless. Honestly, these are way more interesting concepts since it helps ground the people experiencing The Purge in some sort of reality. Sure we should care about the Senator, but one cannot help but root for deli owner Joe Dixon (Mykelti Williamson) every time the group finds themselves in peril. His struggle during the beginning of the second act against a group of young looters is probably one of the most interesting aspects. One has to be curious how our generation would react to such an event and it pretty much devoids into a “don’t worry about, have a good time” attitude towards the whole affair. A particular scene featuring a group of masked females, a Christmas light covered car, and Miley Cyrus’ Party in the U.S.A. embodies everything about the younger generations feelings towards this macabre event. It’s interesting and I would be lying if the payoff to the entire struggle between these two groups wasn’t completely satisfying. Speaking of action, The Purge: Election Year will sate anyone going into this film for the sake of gruesome action. The action is fun and shot well, offering plenty of crowd cheering moments and harrowing scenarios. The Purge: Election Year is also a fairly funny film, as DeMonaco makes the smart choice to not take this movie too seriously. The actors are clearly having fun and almost everyone does a commendable job with the material given. I say almost everyone because Elizabeth Mitchell’s performance is almost too over the top for this film. Her character only ever seems to have two different emotions, and neither of which are portrayed in a convincing manner. And while it’s made clear that she’s a woman of conviction, there are moments when you want to just grab her and scream, “Everyone is trying to kill you! Wake up!” The main villains don’t really fair any better, as they pretty much just exist to drive the narrative forward and keep the action moving along. It’s serviceable, especially since there’s an argument to be made that everyone outside are the villains. The Purge: Election Year won’t revolutionize the action/horror genre, but it simply keeps its head above water. Even with some clear flaws, overall, the film was an entertaining experience and kept the crude action as the main focus. The Purge: Election Year is as blunt and obvious as a shotgun blast in both story and the messages it tries to convey. Thankfully, the fun action and memorable set-pieces make up for some of the films lackluster performances and failure to explore some of the more intriguing concepts. The Purge: Election Year is a movie that has my vote, but it’s not like the opposition was any better.